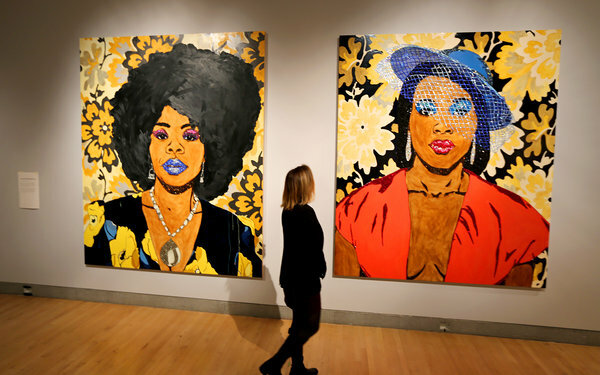 Organized by the Santa Monica Museum of Art in California, and substantially expanded in Brooklyn, “Mickalene Thomas: Origin of the Universe” is a show of broad appeal, free of dumbing down. It has examples of the large, color photo-portraits and clusters of the small, truculent collages that function as studies for Ms. Thomas’s paintings while being works of art themselves. 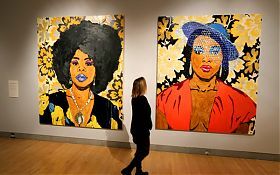 But it is dominated by her big, collagelike paintings, which often depict voluptuous, imperious black women amid swaths of brightly patterned fabrics. The unabashed visual richness of these works attests to the power of the decorative while extending the tenets of Conceptual identity art into an unusually full-bodied form of painting. Enhanced by burning colors; outrageously tactile, rhinestone-studded surfaces; and fractured, almost Cubist perspectives, these images draw equally from 19th- and 20th-century French modernism, portrait painting, 1970s blaxploitation extravagance and an array of postwar pictorial styles.